I understand that it's still February. Many parts of the country still have snow. But yesterday the temperature reached 78 degrees F here in sunny California and my son was asking for some popsicles. I had ripe mangoes and I had passion fruit juice, so here is what we came up with. 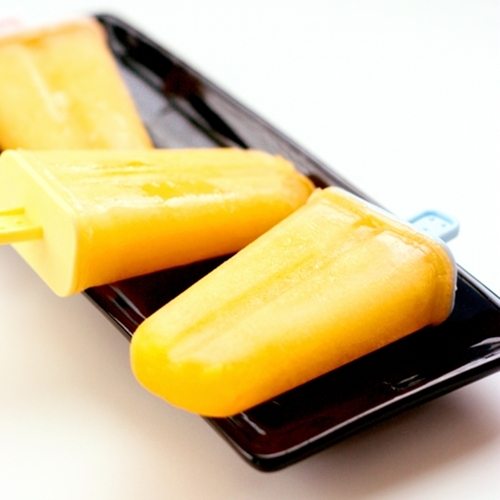 In a blender, whip the mangoes until smooth, stir in passion fruit juice and pour into popsicle molds. Press on the lids and transfer to the freezer for several hours until well frozen. What a treat!!! We had beautiful weather here in San Diego last week as well, however the grey has come in today and I"m freezing! I'd still take one of these popsicles though as you have my tropical favorites! This sounds so delicious and refreshing but I was amazed there was no sugar added to the juices to make it sweeter; our variety of passion fruit we grow in San Diego is extremely tart, fragrant, musky and delicious, but tart. Which variety of passion fruit juice did you use?